Whisk all together drizzle on top of a delicious salad that is full of color, texture and taste. Cleopatra knew the essentials of olive oil thousands of years ago and so do many more women today. Learn what health benefits extra virgin olive oil has externally as a cleanser, for microdermabrasion, and as a moisturizer for the skin and hair. Our skin and hair care products contain the highest quality extra virgin olive oil that provide the anti-inflammatory benefits for skin health. Enjoy knowing that these products are made with care and confidence to promote healthy skin and hair care. Squalane is Found in High Quality Extra Virgin Olive Oil. “Many beauty and skin care experts have lauded the effects of squalane on the skin. This oil, which occurs naturally in the body, is also found in olive oil. More and more beauty products are adding squalane to their cosmetics, skin creams products because experts believe it is a natural moisturizer. What better way to use it than from the direct source than with ‘consciously crushed seasonal extra virgin olive oils’ with a high phenolic count. Our Handcrafted Skin Essential Olive Oils are made in small batches with our Ultra Premium Certified Extra Virgin Olive Oils that have a polyphenol level of 380 – 499ppm. Polyphenols are anti-oxidants that provide anti-inflammatory benefits. There are NO synthetic chemicals, coloring or perfumes added. Only extra virgin olive oil and high quality essential oils that contain no alcohol. See cleansing instructions under Musings section. 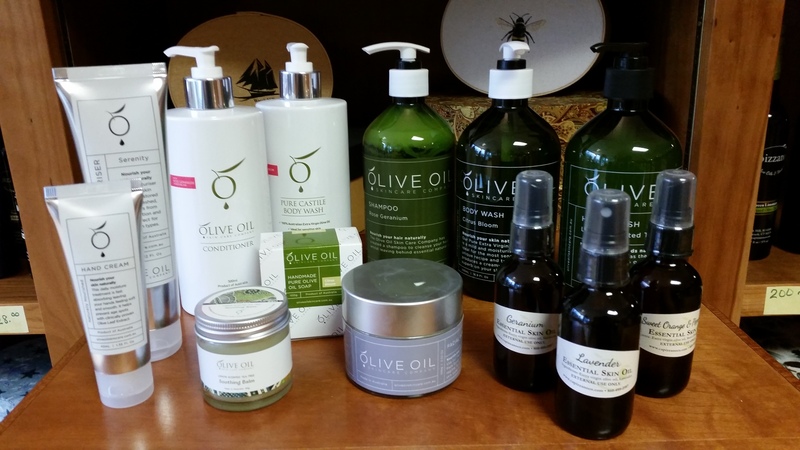 Our Skin and Hair Care come from an exceptional olive grove in Australia, Olive Oil Skincare Company. 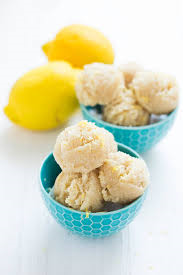 In large bowl, stir together completely; coconut, condensed coconut milk, flour, Lemon Juice (3 TB), lemon zest, and the Green Limonata olive oil. Drop by approximately 1 – 2 TB size on to baking pan lined with parchment paper. Bake for16 minutes or until coconut lightly browns. Cool completely before serving. Store in sealed container when cooled. Option: * can use regular sweetened condensed milk also. Drizzle with our Private Limited Reserve Aged Balsamic Vinegar. Method: In a medium saucepan over medium heat, combine the oil, wine, garlic and pepper flakes. Add the artichokes and bring to a boil. Cook, partially covered, about 5 minutes. Add the fava beans, peas and scallions. Cook 3 minutes more, lower the heat and stir in the escarole, basil, mint and salt to taste. Let simmer partially covered until the artichokes are tender, about 5 minutes. Meanwhile, poach the eggs. Bring about 3 inches of water to a boil in a large saucepan. Add the vinegar to the water and reduce the heat to low. Crack each egg into a small ramekin and gently place the eggs in the simmering water, spacing them out so the whites do not touch. Simmer until the egg whites are set, but the yolks are still runny, 3 to 4 minutes. Using a slotted spoon, gently remove the eggs from the water and place on a paper towel-lined plate to drain. 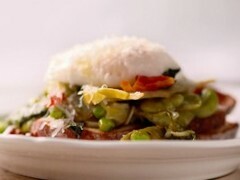 Serve the Scafata warm, topped with a poached egg and the Pecorino Romano cheese. Preheat oven to 350. Mix za’atar with extra virgin olive oil and drizzle over sesame/flax seeds and pita bread. Bake pita bread with EVOO mixture in oven for 10 minutes. Remove. 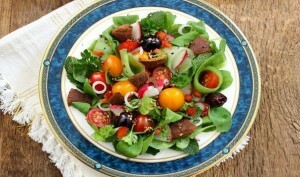 Assemble the ingredients – tomatoes, arugula, cucumber, radishes, leeks, olives, red pepper, mint, parsley. Add pita pieces. Toss. 1. Coat saute pan with UP extra virgin olive oil (EVOO) on medium heat. 2. Evenly space scallops in pan, flat side down. Brown each side, cooking about 1 – 2 minutes per side. Remove from pan. 3. Add more EVOO in pan if dry, saute shallots until translucent. 4. Add Cider Vinegar, cooking down for about 1 minute. Add Cider Syrup and Makai Sea Salt, whisking together. Put cooked scallops back in pan, flipping to coat with glaze. Glaze will caramalize in just a minute so don’t walk away from the pan. Turn heat off immediately if glaze starts to darken. Caramelize don’t burn. 5. 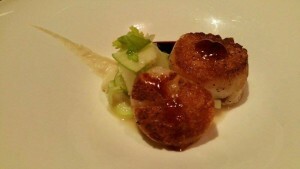 Plate up the scallops and drizzle extra glaze over top. 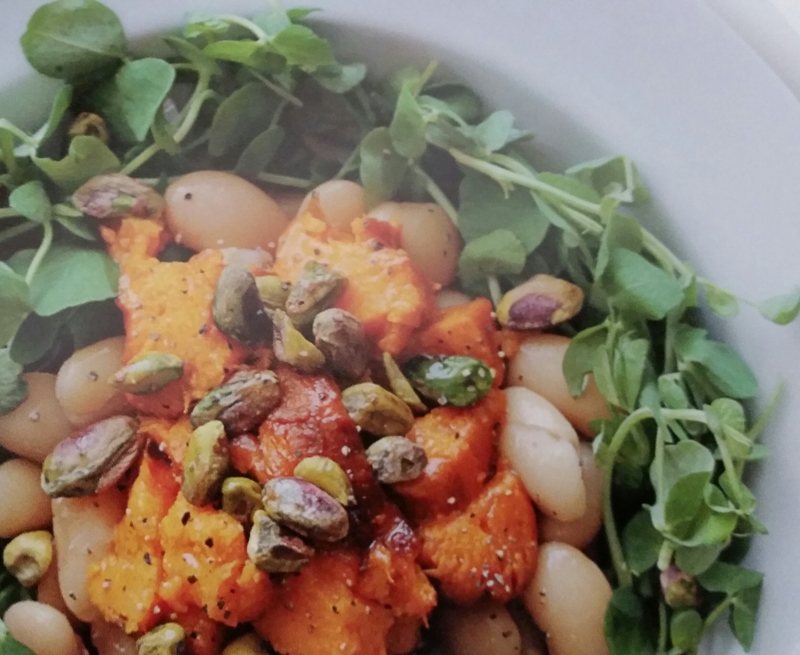 Serve with a shaved cucumber, apple, snap pea and cilantro salad drizzled with emulsified UP extra virgin olive oil (organic Arbequina and Cider Reduction Syrup).